Whether it's attending the event or watching it on TV while you simultaneously follow along online or not, women love to follow award show news via social media and digital content. As part of the POPSUGAR Insights Content, Culture, and Commerce study, we surveyed over 1,500 women between the ages of 18-44 and asked them to tell us which specific cultural events they've followed in the past year. 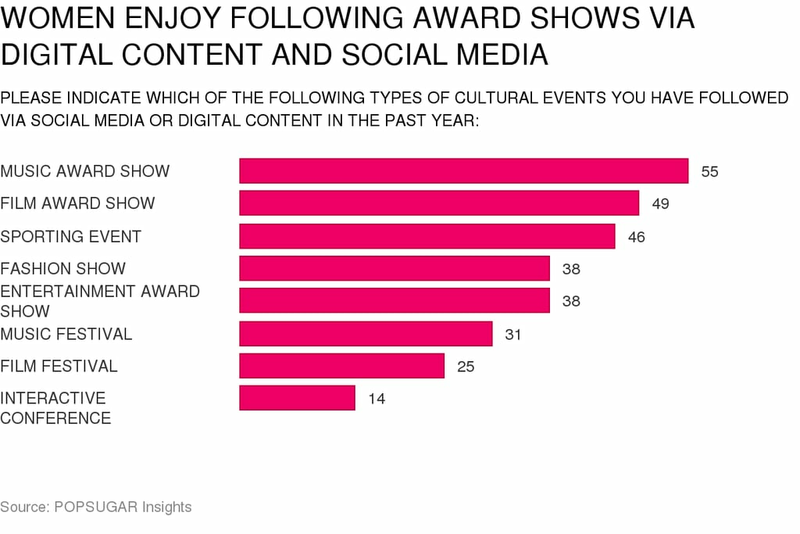 The top ranked type of cultural events for women are music award shows, with 55% of women saying that they follow along via digital content or social media. After music award shows, women enjoy following film award shows (49%), sporting events (46%), fashion shows (39%), entertainment awards (like the Tony Awards or People's Choice Awards), music festivals, (31%), and film festivals (25%).